The majority of our Micro Minis are all within 2 inches height of each other and are 10-12" tall . On average, the size of the baby piglets will be somewhere between the height and length of their parents. Photos of our beautiful piggys don't do them justice; you have to see them in person to see how tiny they are. All of our pigs live right here on our farm and we encourage you to visit the parent of the piglet you are adopting. So you will get to meet your babies mom and dad and get a understanding of the size your new baby should be when grown. Pigs make great indoor or outdoor pets. They are smarter than a dog and allergy free. They are the 4th or 5th smartest animal on the planet. They can be letterbox trained, trained to a harness so it will make it enjoyable to take your new pig on walks. Pigs can learn to do tricks as well. Pig are very loving and love lots of attention. All of the above terms and more have been used to describe the size of the these miniature pigs! 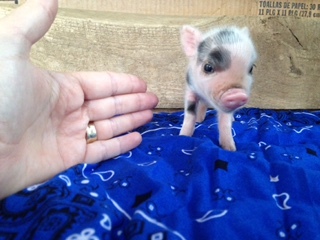 Micro Minis are not a breed of pig - they are a combination of several breeds of pigs to include Juliana, Pot bellies, Kune Kune and Mule Foots that have been selectively reduced in size until they are truly teeny tiny! We have not bred from runts and we do not breed runts. Runts of the litter are often very small because they have health issues. Micro Mini Pigs can be almost any color, have a variety of markings and may even be spotted. All of our baby piglets are Micro Minis or full Julianas though several of our parent pigs are purebred Juliana . General appearance: The Juliana is a small, colorfully spotted pig. It more closely resembles a small version of a large hog or feral pig then it does the Pot Belly pig. It should be lean, longer then it is tall, and athletic in appearence. The Juliana should never be pudgy, heavily wrinkled, or sluggish in appearance. Head: The most prominent feature of the head is a long straight snout that is neither turned up nor snubbed. Eyes are almond shaped, clearly visible, and can be blue to almost black. Ears are small and erect. Heavy jowls are to be discouraged. Body: Lean and musculular the Juliana pig should never look round or flabby. The top line should be straight and of good length. Chest and shoulders should be of medium width, neither broad nor narrow. A slight sway in the back is permissable but discouraged. Belly should be clean and firm. A slight roundness in the belly is permissible, but there should not be a 'Pot belly' present. Leaniency is given to sows who have produced litters. Legs: Set well apart, straight when viewed from the front and rear. Front legs should be set under the shoulders but converge when in motion. Two toes of even length and two dewclaws on each foot. Rear legs should be set apart, but under the body. In motion the legs will converge. When viewed from the side, hocks should be set slightly back and be strong. Hocks should never be luxating or weak. Tail: Straight when relaxed with a switch on the end. When excited or in motion the Juliana tail may curl or twist. Color: Always spotted the base color can be silver, white, red, rust, black, or cream. Spots are generally black but can also be red or white. Spotting should be profuse and random, not in a piebald pattern. Spotting may fade or blend in as the hair coat gets longer, but pigmentaion on the skin must be visible when washed or shaved. Hair coat is coarse, thick and may be quite long in the winter. Size: On average the Juliana pig weighs between 30 - 50 pounds and is 13 - 15 inches in height.